Cristiano Menezes of the Brazilian Agricultural Research Corporation has discovered farming behaviors in bees, adding them to the list of social insects that practice agriculture. Up to now, these black-and-gold balls of fluff were believed to rely solely on pollen and nectar for sustenance. However, a particular species, Scaptotrigona depilis — the Brazilian stingless bee — has been observed growing fungus to be fed to their larvae. Menezes says that if other species that rely on fungi for survival are found, there will be some serious concerns about using fungicides in agriculture. He was studying the bees in the lab, when he found what the believed to be fungus contamination in their hives. But, looking at all 30 hives he had collected as specimens, he found it in each and every one. 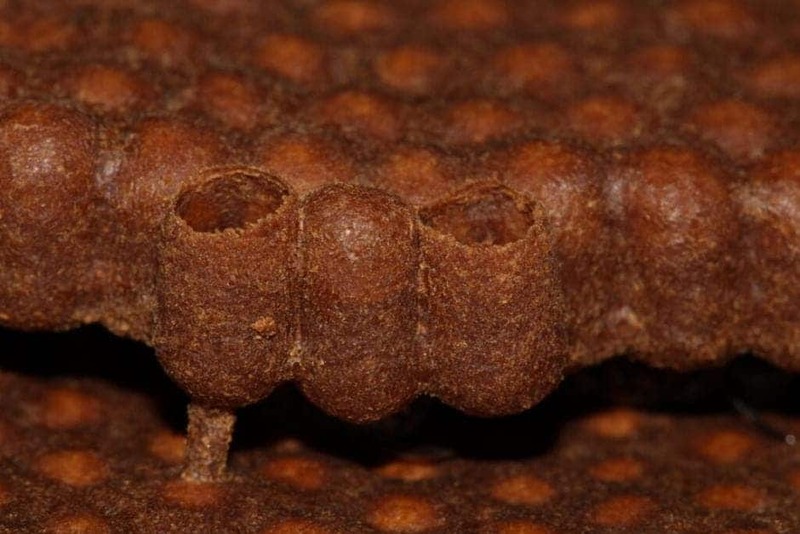 Even more suspiciously, it was growing inside brood cells — the structures that house a hive’s developing larvae. Hmm. Taking a closer look at the presumed contaminant, Menezes began intuiting that maybe it wasn’t the fungi living off the bees, but the other way around. And indeed, it’s a keystone element of the hive — it permeates the cerumen, the waxy material bees build their stuff out off. After the bees lay an egg in each cell, and regurgitate food for the larva, the fungus starts growing from the cerumen into the cell. When the egg hatches, the larva feeds on the fungus, and it can’t feed on anything else. When the team tried to grow bees on a fungus-free diet, the survival rate of larvae dropped immensely, from 72 to only 8 percent. “The survival difference may be either due to some nutrients provided by the fungus, or due to the fungus protecting the regurgitated food from spoiling,” the team reports. When the bees leave their hive to start a new colony, they take some cerumen with them, so “seed” their new brood cells, proving that the bees understand and utilize the fungal agent. “It is clear that the fungus profits from dispersal with the bees, both to new colonies and within the nest, and is offered a protected environment,” says Duur Aanen of Wageningen University in the Netherlands. Menezes calls it “proto-farming” — the bees show some agricultural behaviours, such as “planting” the fungus, and providing stable conditions and nutrients for it to grow, then harvest it, but don’t actively tend to it. These behaviors are seen in other social insects as well, such as ants or termites — one species of ants was reported to even farm animals for meat. Both Menezes and Currie think there are more farming bees to be found. “Given the substantial diversity of bees, many of which are poorly studied, it is likely that other bees engage in similar associations,” Currie says. This raises concern about the use of fungicides, which while not directly harmful to bees, may be affecting them by killing off their symbiotic fungi, Menezes’s team concludes.